This Winnie the Pooh Book Lunch is perfect for the Pooh loving kid in your life! 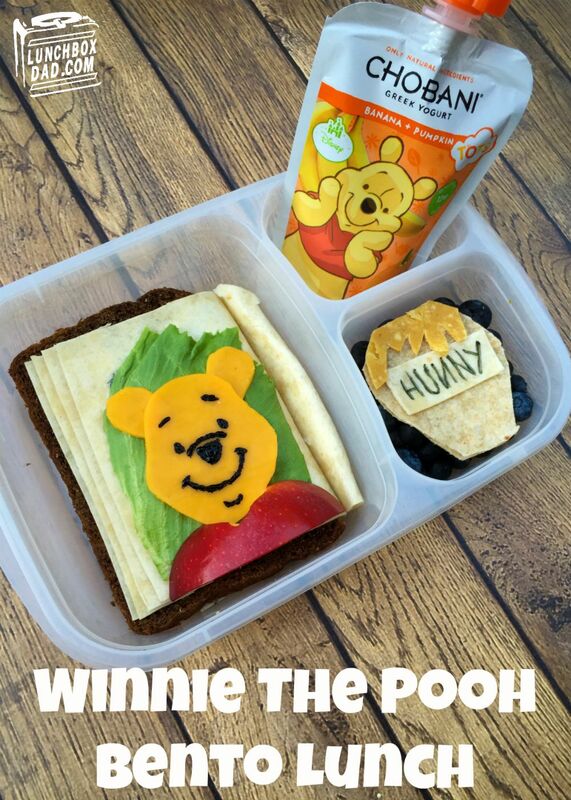 It is designed for the sandwich to look like a children's book! It looks complex but is actually pretty simple to make. My kids loved it! I even found some Chobani yogurt that is Pooh themed. I made it in an Easy Lunch Boxes container. apple, and a little black food coloring. 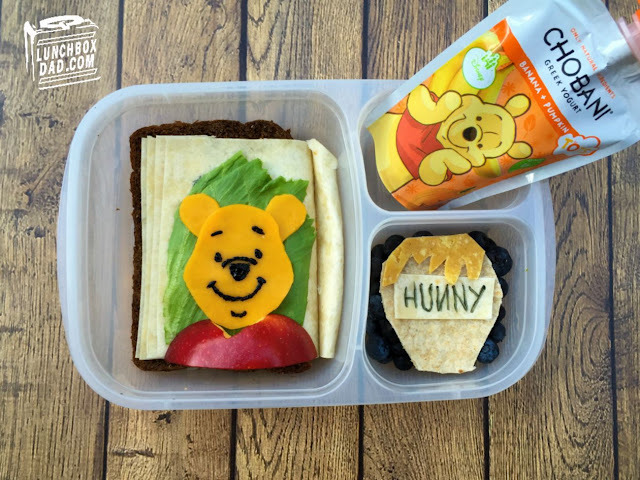 The side dishes are Chobani Greek Yogurt Tots pouch featuring Winnie the Pooh, blueberries, and a honey pot made from whole wheat and corn tortillas. 1. Place one slice of bread in main container. Cut three long, narrow slices of flour tortilla. "Paste" them together as shown like the pages of a book using mustard, mayo, etc. Lay them on the slice of bread. Put down a piece of sliced meat on the bread. Paste down an entire tortilla page on top of everything. Make sure the different pieces look like the ends of pages as shown in the picture above. Finish the book by slightly folding another tortilla piece in half and having it go under the slice of bread. This makes it look like a page that is folded over. You can see what it looks like on the right of the sandwich. 2. Lay a piece of lettuce on the tortilla. 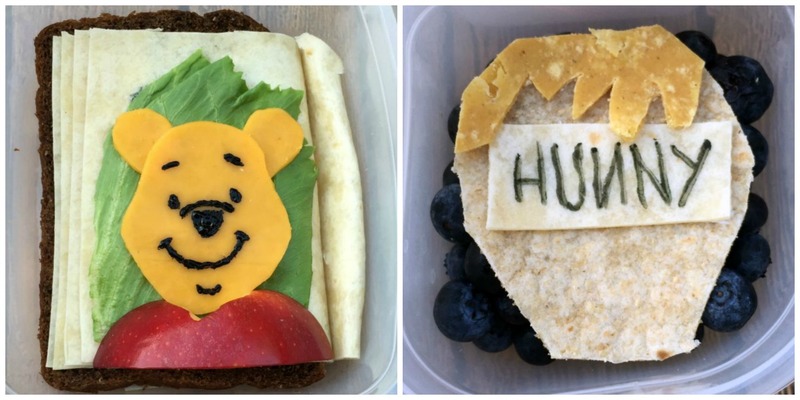 Cut out cheddar cheese in the shape of Pooh's head and his ears. Use a toothpick and black food coloring to draw the simple facial features. Place on lettuce. Cut a slice of apple in the shape of his shirt and put on top of everything. 3. In side dish, drop in blueberries. Cut an oval shaped jar out of tortilla. On a square scrap of tortilla use toothpick and black food coloring again to write the word Hunny. Cut a small jagged piece of corn tortilla and lay on top so that it looks as though honey is flowing down. You can glue the piece together using actual honey! Put honey jar on top of blueberries. 4. In second side dish place yogurt pouch. Serve to your kids for school lunch!